Welcome to the Forum. Thanks for taking the time to introduce yourselves to our members. Hi. Jim Flynn, from Salisbury NC. I've been on this forum for over 10 years, but never really did a intro. As I hope to start a sort of build thread, I thought I'd put something here, 1st. A cousin got me into model RRing, when he asked for help resurrecting his childhood HO layout in the mid 70's. Mainly building some structures for it. I was into military models at that time. Did a couple of plastic kits, and then a Suydam Bekin's warehouse kit. He then brings me a FSM kit, Ezra Cooper's Garage. Opening the box, I was overwhelmed, to say the least. However, I told him I'd give it a shot. Anyone who has built a FSM kit knows that George is a master with his instructions. I followed them and had no problem at all doing the kit, and learning a lot as I did. That kit also sparked my primary interest, structure building, and I build several more FSM kits, as well some from other mfrs. 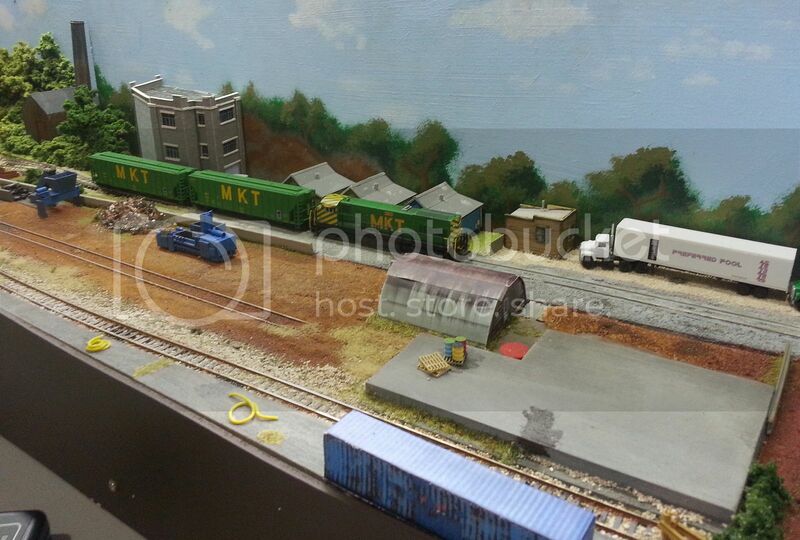 Then I got into N scale with my brother, and stayed pretty much with that until 2008. I worked in a model train store from 2003 to '08, and that burnt me out on model RRing. The bug re-surfaced last year, and I have spent a good part of that time deciding what I wanted to focus on, with regards to scale and gauge. I looked at O, On30, HO, HOn30, N, even UK OO. But I found myself looking at what sort of structure kits were available in each scale. With all that is available in HO, that settled my choice. I also decided I really didn't care if I had trains or not, I would build a few structures and see where it led. Then, on this forum, I came across Greg's (Ensign) RSM Horwood Brother's Garage build thread, and his Vogue Furniture build. I had to have those, and I'll build a large diorama incorporating them into it. I now have the Horwood kit, and ordered the Vogue kit a couple of weeks ago. My 'build' thread won't repeat Greg's and others excellent work, but I'll show anything I decide to do differently, for anyone who is interested. Guess I went on long enough :) I will say that, of the 3 forums that seem to be geared more towards craftsman kit building, this one seems to be the busiest, and has become my favorite. My name is James, and although I have been in Model Railroading since the mid 70s, I have never had a "finished" layout due to my career. I started out in N scale, then G for a short while, then settled on On30 when Bachmann first released their Spectrum line. A few years ago, all of my modeling, and several personal belongings, were lost in a fire. So I get to start from scratch. I like the look of the Bachmann On30 locomotives, and plan to build a shelf layout next year. Probably using an 0-4-2 Porter, or Heisler, or two-truck Shay. Or if I can find one available, a 4-4-0 Forney. I plan on building/kit-bashing all the rolling stock. The theme of the layout will be a marble quarry and some logging, if that can be worked into my small layout. I am currently debating whether to go with DCC or the new wDCC (Wireless DCC) and battery power. At this time, my imaginary layout will be named "The Silver San Juan Railway Co.". Having lived most of my adult life in Colorado, and having walked most of the abandoned grades of the San Juan area where Otto Mears earned his Pathfinder of the San Juans reputation, I feel very "connected" to that area and era of steam railroading. One of my favorite experiences was hiking along what is left of the Corkscrew Gulch right-of-way and finding what was then left of the Corkscrew Gulch Turntable. That was in the mid-70s. I Leave in Le Havre in France and I pratice proto 87 scale. I make a showcase inspired to old archiecture of Le Havre and the industrial railway. I will post photos in the new topic. Greetings, Jim, James and Samuel, glad to find out more about you. Jim, I'll look out for your post. James, there's a pretty busy On30 community here, which I hope you'll enjoy. Samuel, there are a number of other members who are interested in industrial, urban railways, particularly those that served docks and marine industries. I'm looking forward to watch your rendition of the industrial railway. Hello---I am Tom OConnell, now of Verona, Wi, Just retired on 9/5/14 and have been lurking on the Rail-Line Forums for about 6 months. The house we lived in for 34 years we decided to put up for sale and it was listed for 2 weeks when we received an acceptable offer. Very fortunate as we had figured about 18 months to sell it. Moved nearer the Grandkids and that is how I ended up in Verona, which is jut outside of Madison,Wi. I have been in HO since 1972 when my G/F now wife gave me a HO trainset for Xmas. Little did she know what she had set-off. I was a dormat 027 Lionel user since maybe 6 years old. 2 home layouts and 2 club layouts later, I now have a large enough space to start building my empire. I grew attached to the Milwaukee Road, Wisconsin Central and CN, since they all operated in Central Wi as that is where we moved from. I am extremely familar with the CN west from Stevens Point, Wisconsin Rapids,north to Wausau and Superior. That is what I will be looking to recreate. I look forward to participating on the the threads since I have enjoyed reading them and learning so much. Welcome to the Forum and thanks for the introduction. Tom, welcome to retirement, too! I live in Central Wisconsin and we have long, long winters! Since I am now retired I will use much of the winter cold time to build dioramas. Just recently started scratch building and tried 1/20, 1/24 and 1/29 scale. I've decided to settle on 1/29 scale, smaller than the others but easier to see. I love looking at other folks work ... for inspiration and copying the design if it hits my fancy. I hope no one minds! The trains will have to wait until I have more room available. I will post more photos when I'm happy with the scratch building result of the model. I put two of my buildings on the Photography forum under the shacks section. Thank you for letting me be part of this forum. Guff, welcome to the Forum. I did indeed see your shacks over in the Photo Gallery. Very nice modeling. Welcome aboard, Guff. I saw your good looking models in the Photo Gallery and I'm looking forward to seeing more of your work. Thanks for the welcome. I look forward to presenting more of my work. I'm Dan, from Chesterfield in the UK. I've been a fan of US railroads for about 20 years, but only within the last year have I built a layout. Hi Dan and welcome to RRL! Nice looking layout.